"Cavalier King Charles Spaniel" - 6" X 4", Pencil and White Charcoal on Toned Paper. 2019, AVAILABLE, Inquire Through Our Contact Page. "Maea Itching Herself" - 3.75" X 5.5", Pencil on White Paper. 2019, Sketchbook, NFS. "Maea" - 3.75" X 5.5", Pencil on White Paper. 2019, Sketchbook, NFS. "Table With Clutter" - 5.5" X 3.75", Pencil on White Paper. 2019, Sketchbook, NFS. "Sleeping Puppy" - 3.75" X 5.5", Pencil on White Paper. 2019, Sketchbook, NFS. "Mom" - 3.75" X 5.5", Pencil on White Paper. 2019, Sketchbook, NFS. "Mom with Food Plate" - 5.5" X 3.75", Pencil on White Paper. 2019, Sketchbook, NFS. "Maea From Above" - 5.5" X 3.75", Pencil on White Paper. 2019, Sketchbook, NFS. "Maea" - 5.5" X 3.75", Pencil on White Paper. 2019, Sketchbook, NFS. "Mom" - 5.5" X 3.75", Pencil on White Paper. 2019, Sketchbook, NFS. 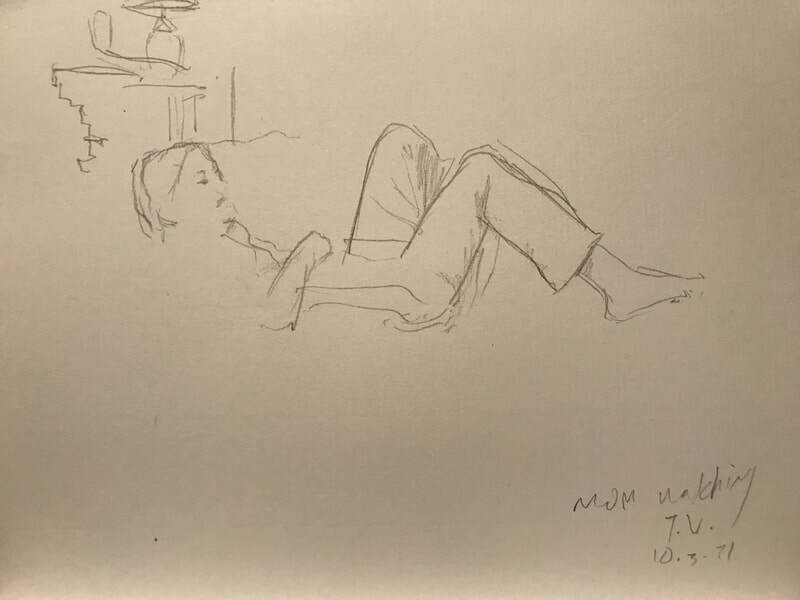 "Dad's Legs" - 5.5" X 3.75", Pencil on White Paper. 2019, Sketchbook, NFS. "Dad" - 15cm X 21cm, Pencil on White Paper. 2019, Sketchbook, NFS. "Mom" - 21cm X 15cm, Pencil on White Paper. 2019, Sketchbook, NFS. "Cat on Back Deck Drinking From Birdbath" - 15cm X 21cm, Pencil on White Paper. 2019, Sketchbook, NFS. "Murphy" - 7" X 5", Pencil and White Charcoal on Toned Paper. 2019. Private Collection, Commission, SOLD. "Mom" - 15cm X 21cm, Pencil on White Paper. 2019, Sketchbook, NFS. "Fishy Sorolla" - 15cm X 21cm, Pencil on White Paper. 2019, Sketchbook, NFS. "Pug" - 8.25" X 7.5", Pencil and White Charcoal on Toned Paper. 2019. Collection of the Artist, NFS. 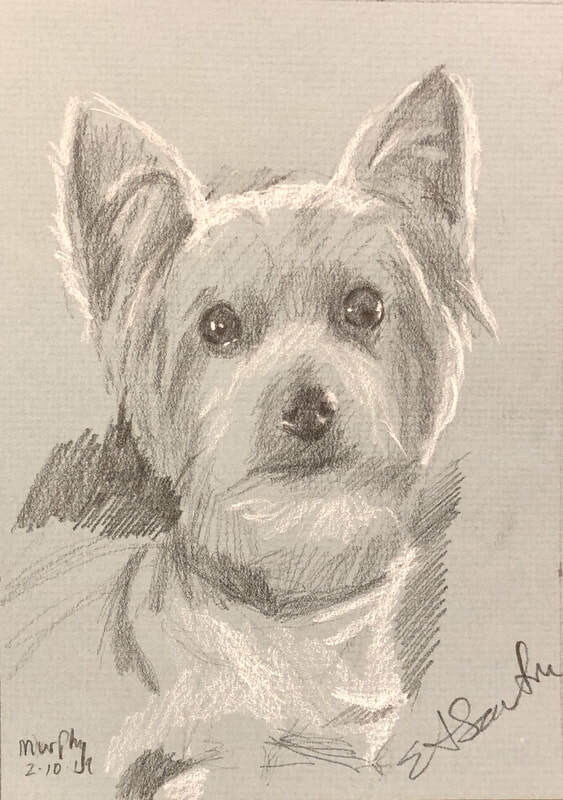 "Yorkie Puppy" - 15cm X 21cm, Pencil on White Paper. 2019, Sketchbook, NFS. "Chair Back" - 15cm X 21cm, Pencil on White Paper. 2019, Sketchbook, NFS. "Cat Drinking Water from Birdbath" - 15cm X 21cm, Pencil on White Paper. 2019, Sketchbook, NFS. "Mom Eating Pomegranate" - 15cm X 21cm, Pencil on White Paper. 2019, Sketchbook, NFS. "Dad's Legs" - 21cm X 15cm, Pencil on White Paper. 2019, Sketchbook, NFS. "Mom in Robe" - 21cm X 15cm, Pencil on White Paper. 2019, Sketchbook, NFS. "Mom Eating Herring" - 15cm X 21cm, Pencil on White Paper. 2018, Sketchbook, NFS. "Mom" - 15cm X 21cm, Pencil on White Paper. 2018, Sketchbook, NFS. "Dad" - 15cm X 21cm, Pencil on White Paper. 2018, Sketchbook, NFS. "Maea Asleep" - 15cm X 21cm, Pencil on White Paper. 2018, Sketchbook, NFS. "Mom Holding Maea in Front of Fire" - 15cm X 21cm, Pencil on White Paper. 2018, Sketchbook, NFS. "Maea" - 15cm X 21cm, Pencil on White Paper. 2018, Sketchbook, NFS. "Dad" - 21cm X 15cm, Pencil on White Paper. 2018, Sketchbook, NFS. "House Plant" - 5.75" X 3.5", Pencil on White Paper. 2018, Sketchbook, NFS. "Black Pug" - 14" X 11", Charcoal on White Paper. 2018. AVAILABLE. "Golden Retriever" - 3.75" X 5", Pencil and White India Ink Marker on Toned Paper. 2018. Sketchbook, NFS. 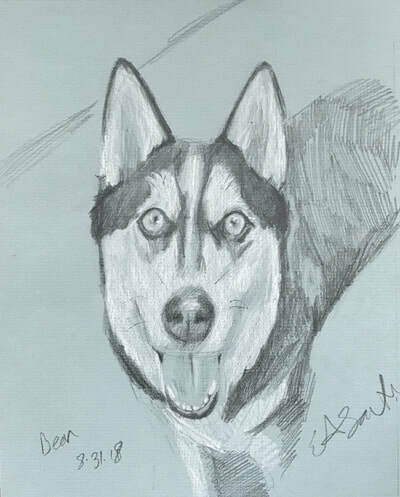 "Dog Sketch" - 15cm X 21cm, Pencil on White Paper. 2018, Sketchbook, NFS. "Norfolk Terrier" - 15cm X 21cm, Pencil on White Paper. 2018, Sketchbook, NFS. "Norfolk Terrier" - 15cm X 21cm, Pencil and White India Ink Marker on White Paper. 2018, Sketchbook, NFS. "Bear" - 10" X 8", Pencil and White Charcoal on Toned Paper. 2018. Private Collection, Commission, SOLD. "Beagle" - 9" X 9", Pencil, White Charcoal and White India Ink Marker on Toned Paper. 2018. Sketchbook, NFS. "Mini Poodle" - 15cm X 21cm, Pencil on White Paper. 2018, Sketchbook, NFS. "Ferret Studies" - 9" X 9", Pencil and White Charcoal on Toned Paper. 2018. Sketchbook, NFS. "Dandee" - 10" X 8", Pencil and White Charcoal on Toned Paper. 2018. Private Collection, Commission, SOLD. 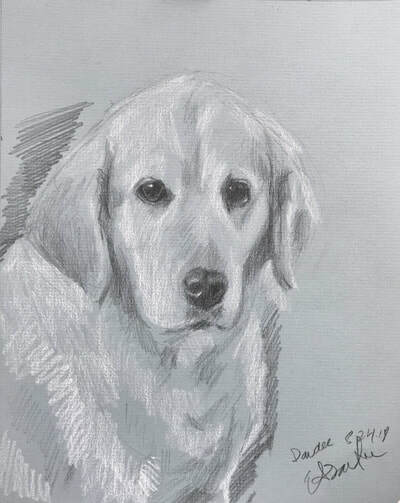 "Puppy in a Field" - 15cm X 21cm, Pencil on White Paper. 2018, Sketchbook, NFS. "Blue Pitbull Puppy" - 9" X 9", Pencil and White Charcoal on Toned Paper. 2018. Sketchbook, NFS. "Puppies Playing" - 15cm X 21cm, Pencil on White Paper. 2018, Sketchbook, NFS. "Golden Retriever Puppy" - 15cm X 21cm, Pencil and White India Ink Marker on White Paper. 2018, Sketchbook, NFS. "French Bulldog Puppy" - 9" X 9", Pencil and White Charcoal on Toned Paper. 2018. Sketchbook, NFS. "French Bulldog" - 15cm X 21cm, Pencil and White India Ink Marker on White Paper. 2018, Sketchbook, NFS. "Sleeping Puppies" - 15cm X 21cm, Pencil on White Paper. 2018, Sketchbook, NFS. 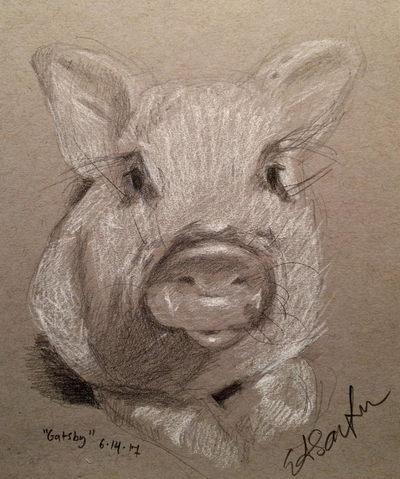 "Paca" - 9" X 9", Pencil and White Charcoal on Toned Paper. 2018. Sketchbook, NFS. "Baby Pig Being Held" - 21cm X 15cm, Pencil on White Paper. 2018, Sketchbook, NFS. "Dad" - 5" X 3.75", Pencil and White India Ink Marker on Toned Paper. 2018. Sketchbook, NFS. 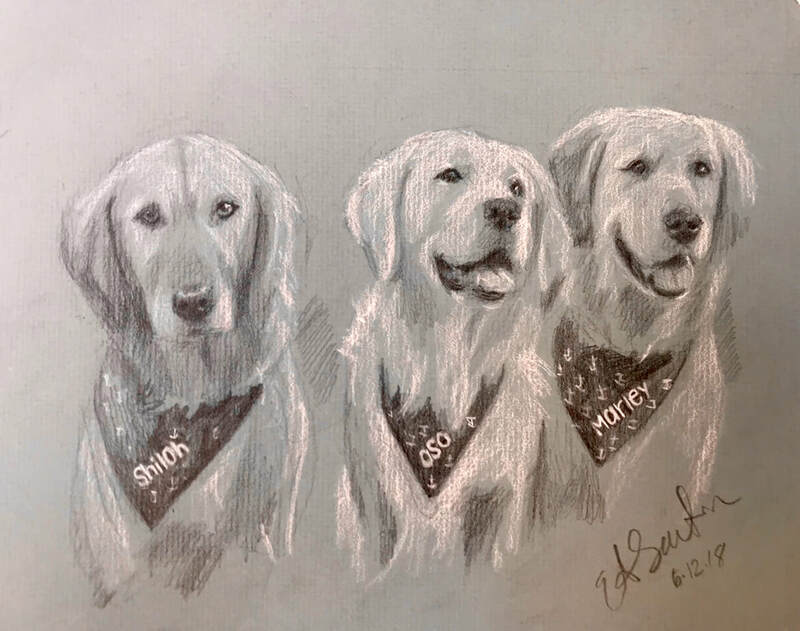 "Shiloh, Oso and Marley" - 8" X 10", Pencil and White Charcoal on Toned Paper. 2018. Private Collection, Commission, SOLD. 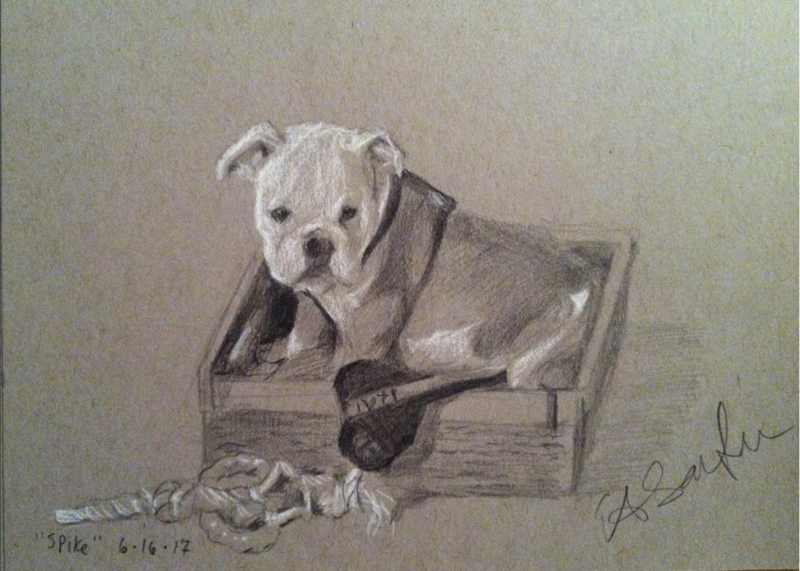 "Whiskey" - 10" X 8", Pencil and White Charcoal on Toned Paper. 2018. Private Collection, Commission, SOLD. "Jedi, Odin and Nova" - 8" X 10", Pencil and White Charcoal on Toned Paper. 2018. Private Collection, Commission, SOLD. "Rookie" - 10" X 8", Pencil and White Charcoal on Toned Paper. 2018. Private Collection, Commission, SOLD. 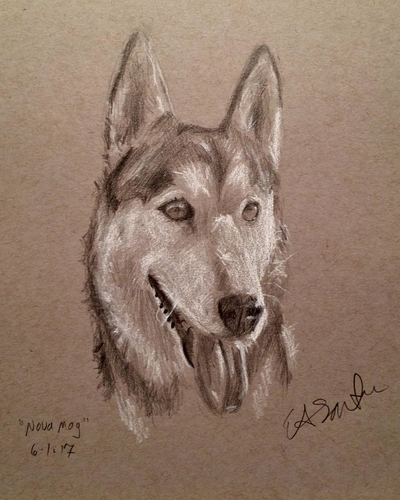 "Skye" - 7" X 5", Pencil and White Charcoal on Toned Paper. 2018. Private Collection, Commission, SOLD. "Elvis" - 9" X 6", Pencil and White Charcoal on Toned Paper. 2018, Private Collection, Commission, SOLD. "Study of a Cherub" - 9" X 8", Pencil and White Charcoal on Toned Paper. 2018. AVAILABLE. "Preliminary Sketch for 'Our Old Dutch Clock' Painting" - 7.25" X 5", Pencil on White Paper. 2018, Sketchbook, NFS. "Study of an Eye" - 4" X 6", Pencil and White Charcoal on Toned Paper. 2018, AVAILABLE. "Tom" - 8" X 8", Pencil and White Charcoal on Toned Paper. 2018, AVAILABLE. 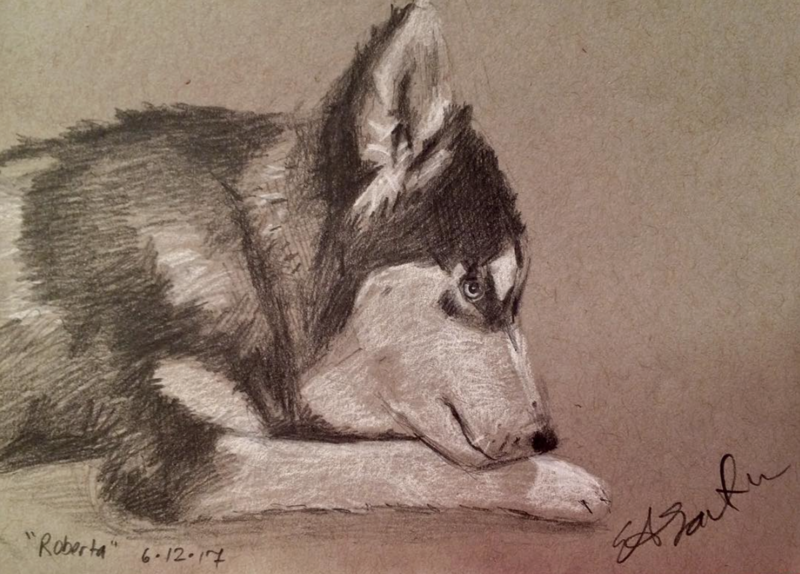 "Puppy" - 5" X 7.25", Pencil on White Paper. 2018, Sketchbook, NFS. "Dad" - 5" X 7.25", Pencil on White Paper. 2018, Sketchbook, NFS. "Laura, Head on my Lap" - 5" X 7.25", Pencil on White Paper. 2018, Sketchbook, NFS. "Dachshund" - 9" X 9", Pencil and White Charcoal on Toned Paper. 2018. Sketchbook, NFS. "Eagle" - 6.5" X 6.5", Pencil and White Charcoal on Toned Paper. 2018, AVAILABLE. "Ella" - 10" X 8", Pencil and White Charcoal on Toned Paper. 2018. Private Collection, Commission, Gift. "Study of a Girl" - 12" X 9", Nitram Charcoal on Natural White Paper. 2018, AVAILABLE. "Stack of Books + Stuff" - 5" X 7.25", Pencil on White Paper. 2018, Sketchbook, NFS. "Portrait of my Brother Chris" - 12" X 9", Charcoal on Natural White Paper. 2017, Private Collection, Gift. 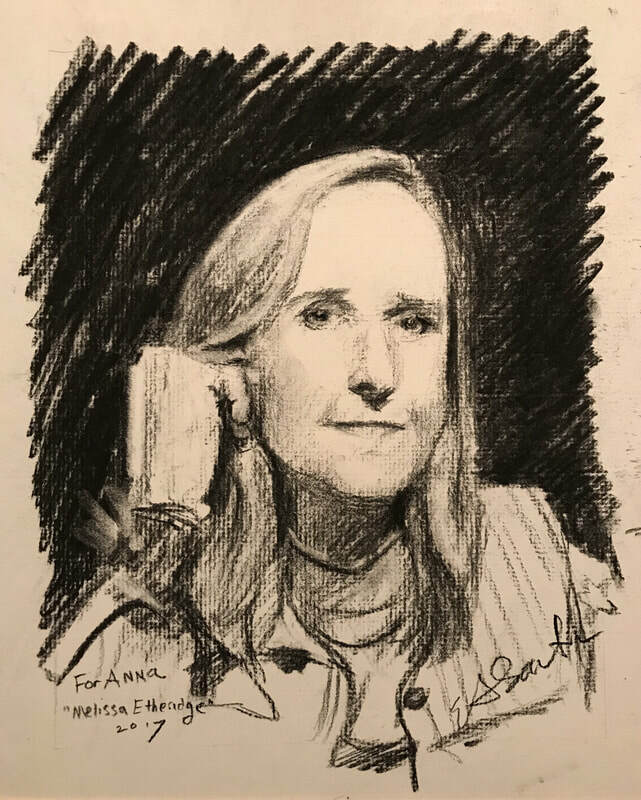 "Melissa Etheridge" - 12" X 9", Charcoal on Natural White Paper. 2017, Private Collection, Gift. "Statue of a Dog" - 5" X 7.25", Pencil on White Paper. 2017, Sketchbook, NFS. "Table Leg" - 5.25" X 5", Pencil on White Paper. 2017, Sketchbook, NFS. "Mom Crocheting" - 5" X 7.25", Pencil on White Paper. 2017, Sketchbook, NFS. "Laura" - 9" X 12", Charcoal on Natural White Paper. 2017. Private Collection, Gift. "Ginger Cat" - 6" X 7", Pencil and White Charcoal on Toned Paper. 2017, Sketchbook, NFS. "Sultan The Barbary Lion, London Zoo, 1897" - 7" X 5", Pencil on White Paper. 2017. Private Collection, Gift. "Walter and Amelia" - 4" X 6", Pencil and White Charcoal on Toned Paper. 2017. Private Collection, Commission, Gift. "Charlie" - 10" X 8", Pencil and White Charcoal on Toned Paper. 2017, FRAMED, AVAILABLE. 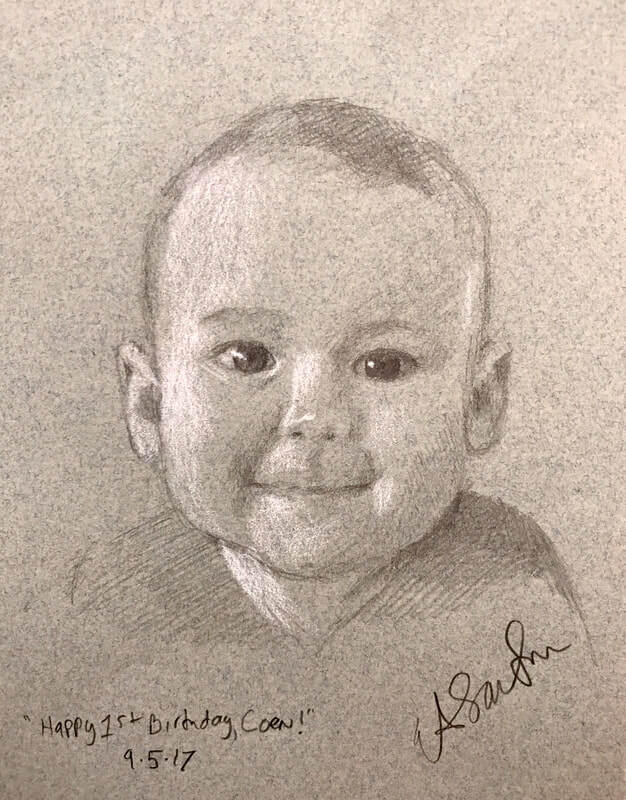 "Coen Birthday Portrait" - 7" X 5", Pencil and White Charcoal on Toned Paper. 2017. Private Collection, Gift. 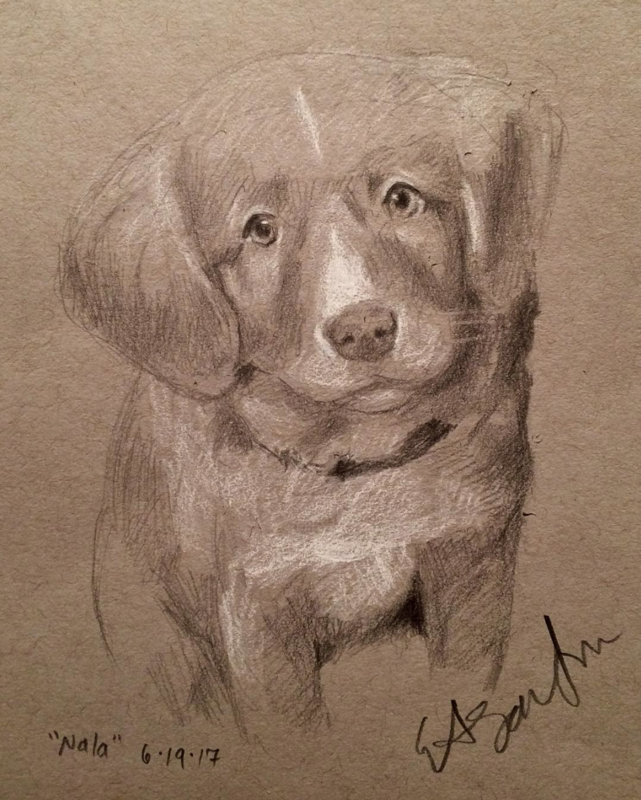 "Beagle Puppy" - 7" X 7", Pencil and White Charcoal on Toned Paper. 2017. Sketchbook, NFS. "Jude and Max" - 5" X 7", Pencil and White Charcoal on Toned Paper. 2017. Private Collection, Gift. "Bernese Mountain Dog" - 7" X 7", Pencil and White Charcoal on Toned Paper. 2017. Sketchbook, NFS. "Labradoodle Puppy" - 6" X 7", Pencil and White Charcoal on Toned Paper. 2017. Sketchbook, NFS. "Baby Duck" - 8" X 7", Pencil and White Charcoal on Toned Paper. 2017. AVAILABLE. "Baby Deer" - 9" X 9", Pencil and White Charcoal on Toned Paper. 2017. Sketchbook, NFS. 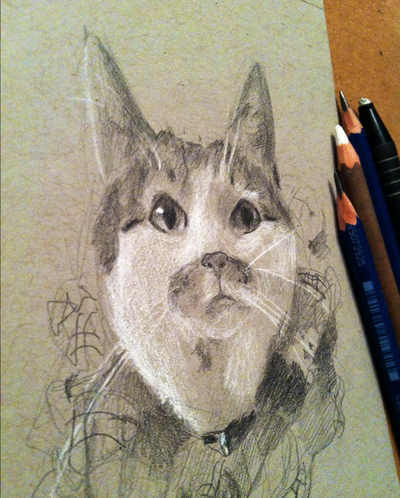 "Lya's Cat" - 5" X 7", Pencil and White Charcoal on Toned Paper. 2017. Private Collection, Commission, SOLD. "Kitten" - 4.5" X 5", Pencil and White Charcoal on Toned Paper. 2017. Sketchbook, NFS. "Study of a Pug" - 5" X 7", Pencil and White Charcoal on Toned Paper. 2017. Sketchbook, NFS. "Study of a Spaniel" - 6" X 7", Pastel on Toned Paper. 2017, NFS. "Study of a Rabbit" - 7" X 5", Pencil and White Charcoal on Toned Paper. 2017. AVAILABLE. 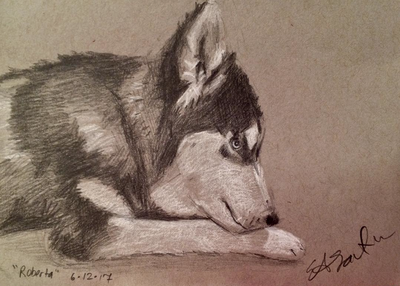 "Study of a Puppy" - 5" X 7", Pencil and White Charcoal on Toned Paper. 2017. Sketchbook, NFS. "Winston" - 7" X 5", Pencil and White Charcoal on Toned Paper. 2017. Private Collection, Commission, SOLD. "Autumn" - 10" X 8", Pencil and White Charcoal on Toned Paper. 2017. Private Collection, Commission, SOLD. 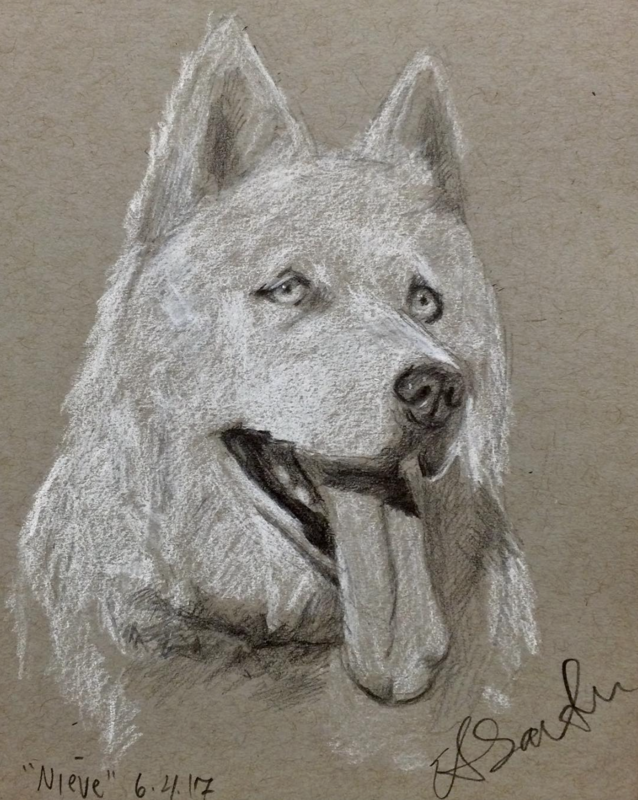 "Wrigley" - 7" X 5", Pencil and White Charcoal on Toned Paper. 2017. Private Collection, Commission, SOLD. "Demi" - 7" X 5", Pencil and White Charcoal on Toned Paper. 2017. Private Collection, Commission, SOLD. 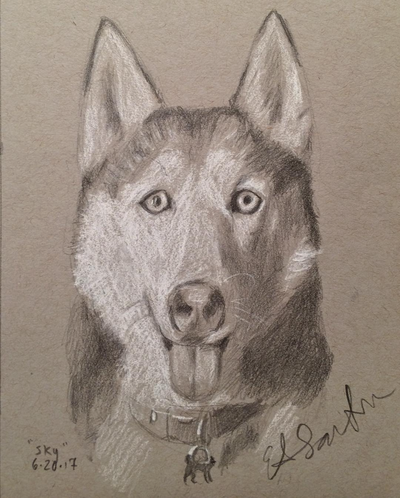 "Sasha" - 7" X 5", Pencil and White Charcoal on Toned Paper. 2017. Private Collection, Commission, SOLD. "Cleo" - 7" X 5", Pencil and White Charcoal on Toned Paper. 2017. Private Collection, Commission, SOLD. "Study of a Cat" - 5" X 7", Pencil and White Charcoal on Toned Paper. 2017, Sketchbook, NFS. "Study of an Eye" - 5" X 7", Pencil and White Charcoal on Toned Paper. 2017. Private Collection, Gift. "Study of a Hedgehog" - 5" X 7", Pencil and White Charcoal on Toned Paper. 2017. NFS. "Study of a Baby Bunny" - 5" X 7", Pencil and White Charcoal on Toned Paper. 2017. Private Collection, Gift. "Skye" - 7" X 5", Pencil and White Charcoal on Toned Paper. 2017. Private Collection, Commission, SOLD. 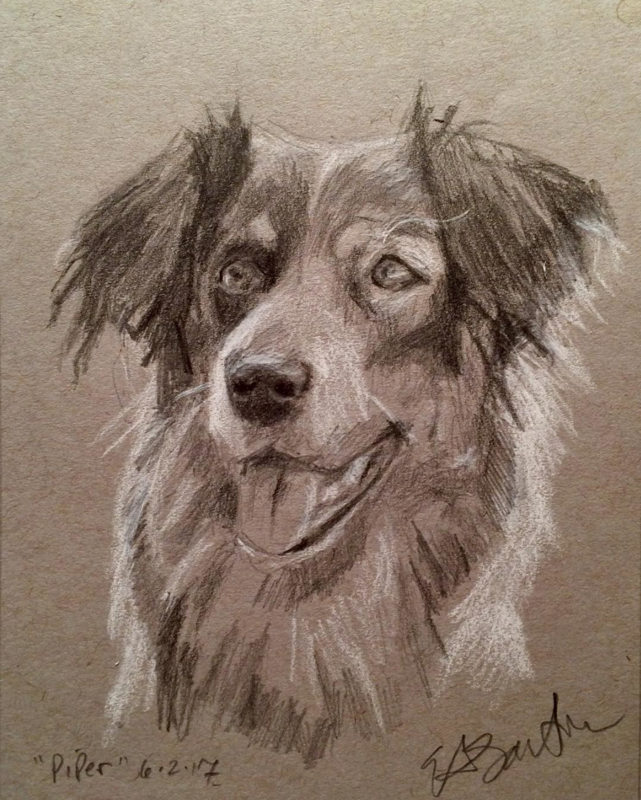 "Ozzie" - 7" X 5", Pencil and White Charcoal on Toned Paper. 2017. Private Collection, Commission, SOLD. "Teddy" - 7" X 5", Pencil and White Charcoal on Toned Paper. 2017. Private Collection, Commission, SOLD. "Bear and Simba" - 8" X 10", Pencil and White Charcoal on Toned Paper. 2017. Private Collection, Commission, SOLD. 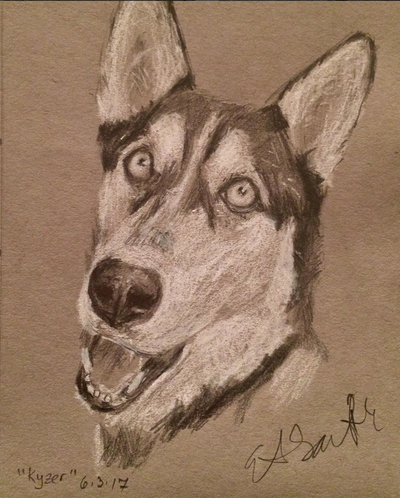 "Bolt" - 7" X 5", Pencil and White Charcoal on Toned Paper. 2017. Private Collection, Commission, SOLD. "Grandpa and Riggs" - 10" X 8", Pencil and White Charcoal on Toned Paper. 2017. Private Collection, Commission, SOLD. 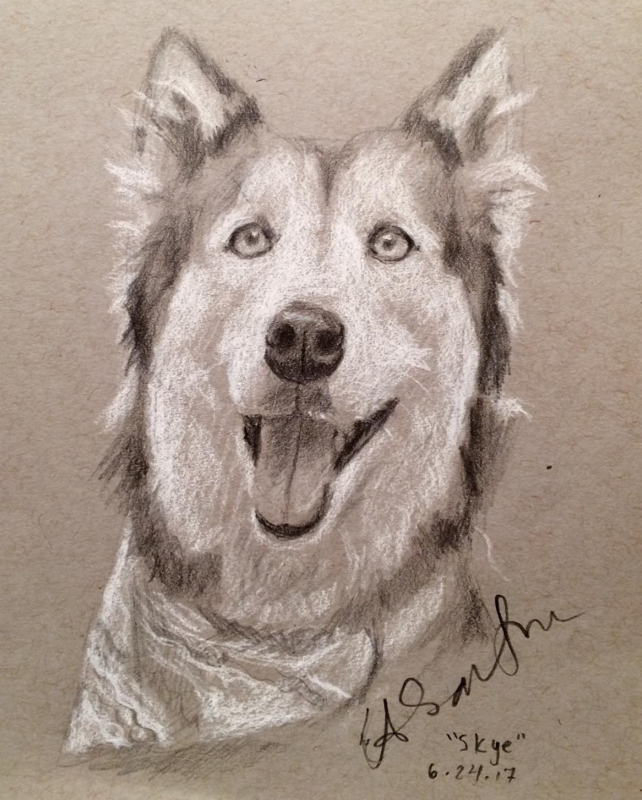 "Nala" - 7" X 5", Pencil and White Charcoal on Toned Paper. 2017. Private Collection, Commission, SOLD. "Mr. Otis" - 7" X 5", Pencil and White Charcoal on Toned Paper. 2017. Private Collection, Commission, SOLD. "Sky" - 7" X 5", Pencil and White Charcoal on Toned Paper. 2017. Private Collection, Commission, SOLD. "Lincoln" - 7" X 5", Pencil and White Charcoal on Toned Paper. 2017. Private Collection, Commission, SOLD. "Spike" - 5" X 7", Pencil and White Charcoal on Toned Paper. 2017. Private Collection, Commission, SOLD. "Gatsby" - 7" X 5", Pencil and White Charcoal on Toned Paper. 2017. Private Collection, Commission, SOLD. 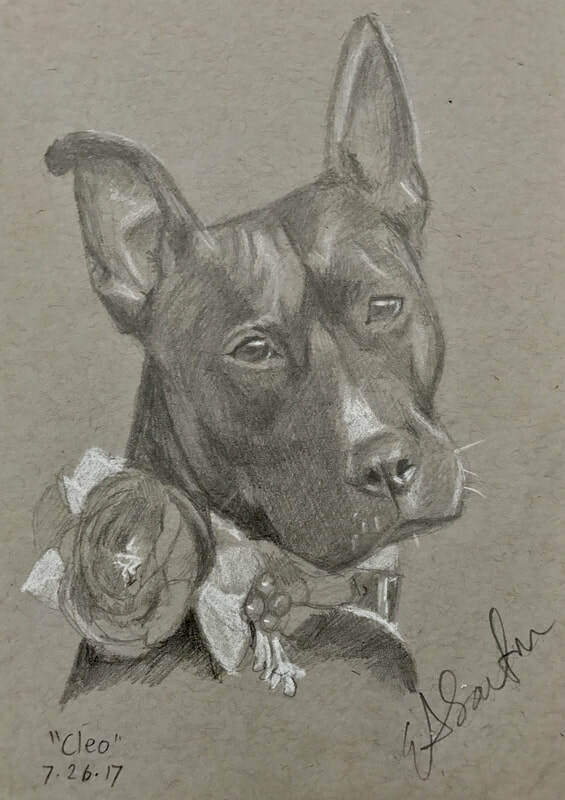 "Roberta" - 5" X 7", Pencil and White Charcoal on Toned Paper. 2017. Private Collection, Commission, SOLD. "Nieve" - 7" X 5", Pencil and White Charcoal on Toned Paper. 2017. Private Collection, SOLD. 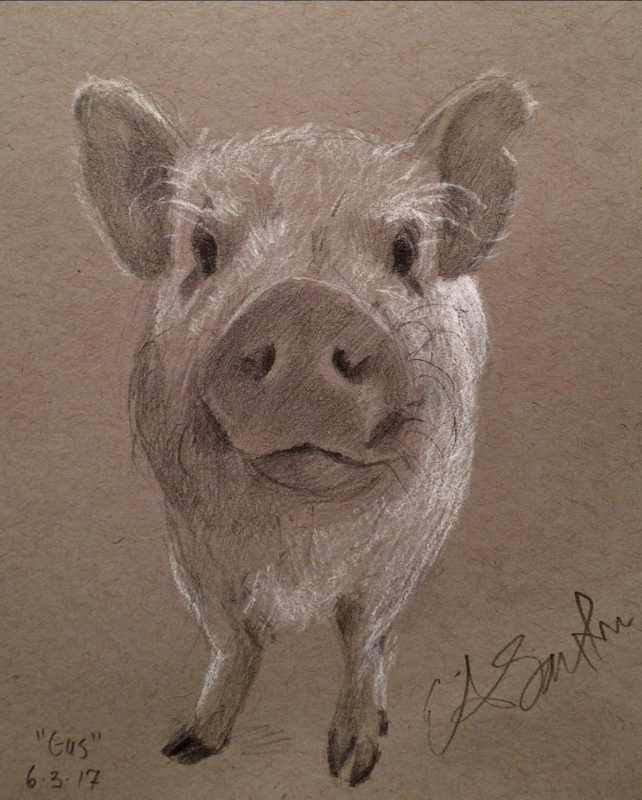 "Gus" - 7" X 5", Pencil and White Charcoal on Toned Paper. 2017. Private Collection, SOLD. 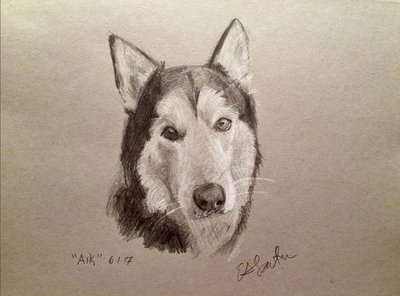 "Kyzer" - 7" X 5", Pencil and White Charcoal on Toned Paper. 2017. Private Collection, SOLD. "Nova May" - 7" X 5", Pencil and White Charcoal on Toned Paper. 2017. Private Collection, SOLD. "Aik" - 10" X 8", Pencil and White Charcoal on Toned Paper. 2017. Private Collection, SOLD. "Noelle" - 10" X 8", Pencil and White Charcoal on Toned Paper, 2017, NFS. "Study of my Eye" - 5" X 7", Pencil and White Charcoal on Toned Paper. 2016. Collection of the Artist, NFS. 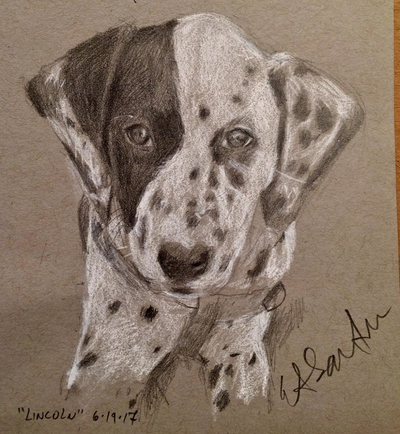 "Study of a Puppy" - 9" X 12", Pencil and White Charcoal on Toned Paper. 2016. NFS. "Robin on Magnolia Tree" - Pencil and White Charcoal on Toned Paper. 2016. NFS. "Study of an Angel" - 8.5" X 11", Pencil on Paper. 2016. Sketchbook, NFS. "Lily" - Pastel on Paper. Collection of the Artist, NFS. "Figure Drawing"- 9" X 9", Pencil and White Charcoal on Toned Paper. 2014, Sketchbook, NFS. "Head of a Young Girl" - 7.5" X 4", Pencil and White Charcoal on Toned Paper. 2013. FRAMED, NFS. "Figure Drawing" - Pencil and White Charcoal on Toned Paper. 2012. Private Collection, Gift. "Lily" - Charcoal and White Charcoal on Toned Paper. Collection of the Artist, NFS. 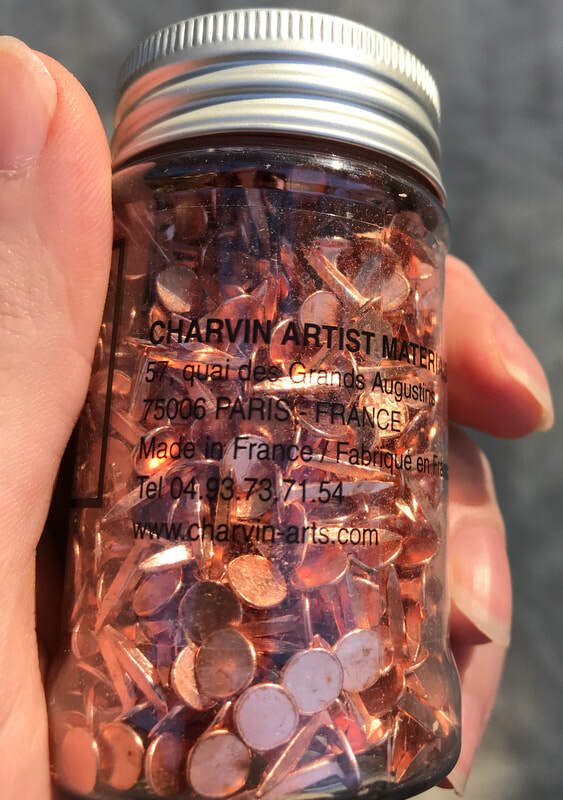 Questions about a specific piece? Visit our contact page and let us know!